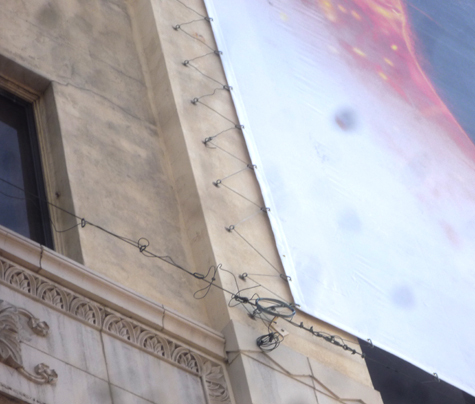 One day after the City Attorney filed a multi-million dollar lawsuit against a company for putting up illegal supergraphic signs, another company installed an apparently illegal sign on the historic First National Bank Building at Hollywood & Highland, just in time for the March 7 Academy Awards at the Kodak Theater across the street. The thousands who always gather in the street outside the theater will see the sign, and TV viewers might even get a glimpse if cameras pan in that direction. The supergraphic that went up two days ago without any permits is made of vinyl and attached to the building with eyebolts and cables, a method that has aroused the ire of historic preservationists, beyond general opposition to such advertising on historically-significant structures. The sign company, iMedia Outdoor, stated in a marketing brochure apparently circulated to potential advertisers that the building would get two electronic screens totalling more than 4,500 sq. ft. that would display changing ads. The brochure listed a fee of $216,000 for a single ad on Oscars night. 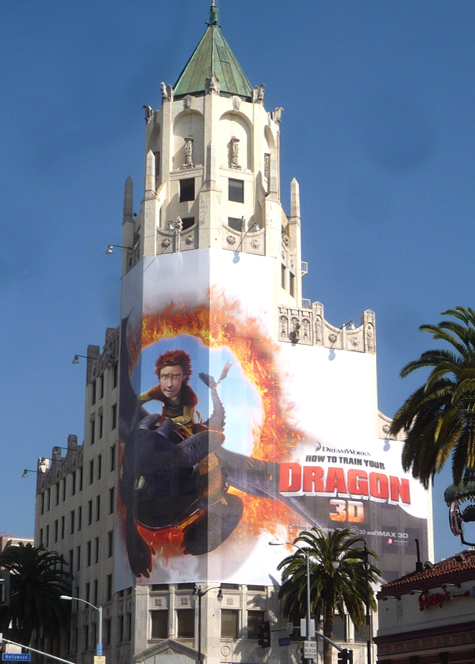 See Company Plans 8-story Digital Ad Screens on Historic Hollywood Building. Whether or not those digital screens are still coming is not known.